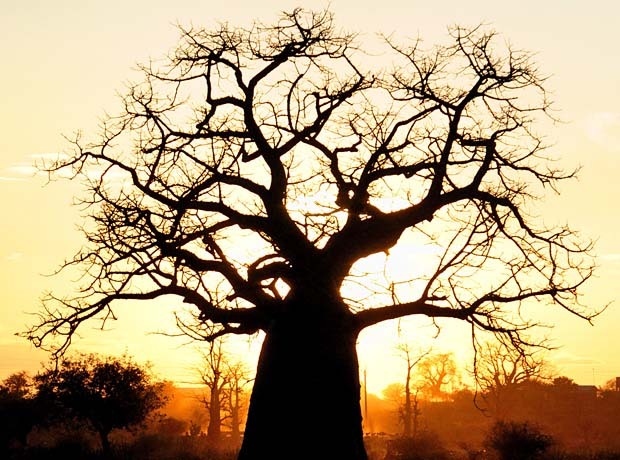 The majestic baobab is by far the most iconic tree of the African bush. There are nine species with two native to Africa. These giants can grow to be a 1000 years old! 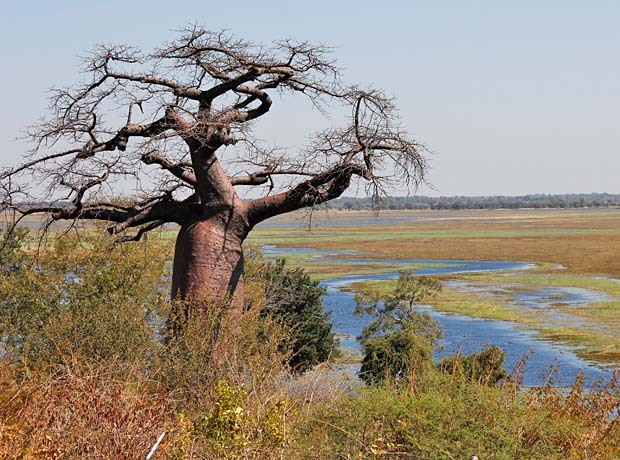 Tales of baobabs have always been told for generations. Here in Tanzania it is no different. Tanzanians believe that the tree has some kind of mystical thing about it. There is a famous story told that during the time when God was adding the finishing touches to the world, he knew that in Africa he needed to create something useful. Water would always be a problem on the continent so he came up with the baobab. The plan was to make the tree hollow in the top so that it could store water after the rains. God was very proud of this creation but the devil did not find it so great. The devil took his revenge by turning all the trees upside down. If you look at a baobab you will notice that it looks like the roots are sticking up into the sky, the hollow part now being in lower part of the tree. The hollow tree trunks are used as shelter by Bushmen. Some trunks can be big enough to accommodate up to 30 people. The wood of the tree is not very useful as it is too soft with a texture like that of a sponge. The fruits on the other hand are extremely useful and very healthy. Today more and more people regard the baobab’s fruit as a super fruit. Oil can also be extracted from the seeds and used as a moisturiser. While growing up in Africa it was very common for us to go out and get the fruit from the tree. We would pour water inside and the whole thing would be shaken for a few minutes after which we had a lovely fresh juice. The fruit itself is white to light red and if you have a good tree, it can be very sweet. In Tanzania today you can find processed baobab fruit in shops and street stands everywhere. People like to eat them when travelling as they believe that it prevents travel sickness. 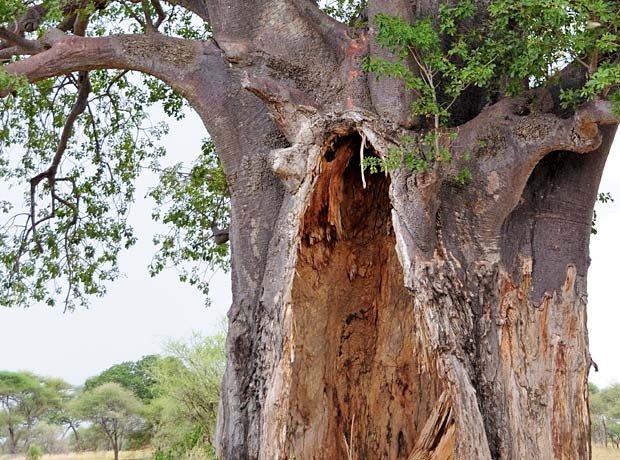 In the wild, animals depend on the baobab as a source of moisture and in areas where elephants are found, you will notice that the bark of the tree has been peeled off. Elephants do this as the bark and flesh of the tree are still full of water even during a very dry season. 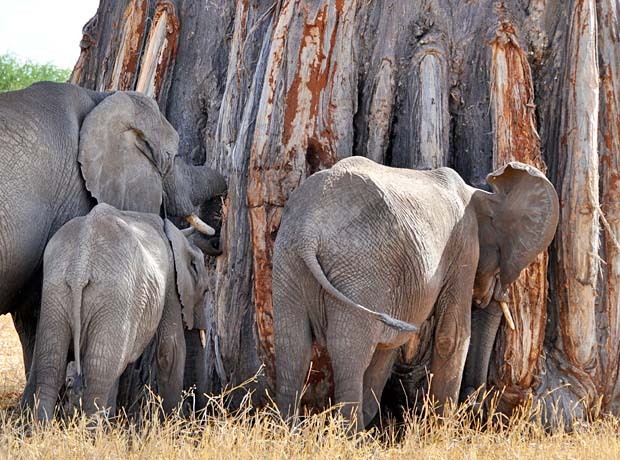 Sometimes elephants rip away too much of the tree causing it to collapse. Some animals work together to benefit from the tree. Baboons in particular are the ones that climb the trees and drop the fruits for the ground dwellers such as impalas, warthogs, buffalos and elephants. Tarangire National Park in Tanzania is a very good place to see these huge trees in their natural environment. I like to call the park “the baobab garden”.